April 28 10:00am-12:00pm will be our next class for muscle testing. Learn at-home care for the whole family! Dog, cat, fish or frog. Even kids and spouses! Did you know Dr. Candice massaged her son's tadpole because it was going to die from having it's leg stuck inside its body? Kermit was right; it's not easy being green. Be creative...you can muscle test your animals too! This class will build on aspects from previous muscle testing classes. We will include emotional, nutritional and household items. Free--upon request at time of scheduling--Dr. Candice is offering laser treatment with adjustment, or brain integration therapy with proper nutrition counseling at your appointment, free of charge. You MUST schedule for one of these complementary services beforehand, to allow us to remain on schedule and accommodate all our patients' needs. Thank you! Have you heard? Neotame, a synthetic sweetener chemical, does not have to be labeled in food products, including even in organic food products, as ruled by the U.S. Food and Drug Administration (FDA). Which means this modified version of aspartame with even more added toxicity, could be lurking in the foods you eat every day. Would you know it? Just like aspartame, the FDA has quietly approved this dangerous sweetener chemical that metabolizes into formaldehyde, a KNOWN CARCINOGEN, when consumed. Additionally, the chemical also contains added 3-dimethylbutyl, which the U.S. Environmental Protection Agency (EPA) has listed as one of the most hazardous known chemicals, and does not have to be labeled on any of the products to which it is added. Unfortunately, like most other toxins added to foods, neotame will most likely cause chronic damage over a long period of time, in the form of gradual neurotoxic and immunotoxic damage. Talk to Dr. Candice today about what supplements we offer that can combat the effects of such toxicity. And take a look at the information on Complete Neuro, one of our featured health products for March! Happy March! We have some exciting and fun promotions running this month, including the chance to win a TENS and EMS system, a discount when wearing green to your appointment, and FREE laser treatments with your adjustment, just for the asking! Discover Total Trim, Complete Neuro & information about a toxin that may be lurking in the foods that you consume every day. Education is power! 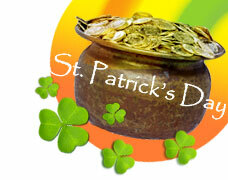 You don't have to be Irish to find luck at ACWC! No tricks here, just fun opportunities to save some green and improve your health. Wear green clothing to your appointment and get $10 off* a regular priced massage or adjustment OR 5% off* anything in our health store. and you'll be entered into the LUCKY Drawing! Win a TENS and EMS system for your own home use. March and April referrals eligible. Weight loss and brain health are two important aspects of good health we'd like to highlight this month. We are offering two amazing products that address the nutritional aspects of healthy weight loss and maintenance of good brain health this month. Read on to learn about Total Trim and Complete Neuro. Maximize optimal weight loss with this newer supplement! The Total Trim formula supports the balance of normal functions and organ systems that contribute to the HEALTHY maintenance of proper weight. Multiple organ support for energy, metabolism, cleansing, elimination, etc. WITHOUT the use of stimulants, digestion blockers, nutrient binders, allergenic substances and other harmful ingredients that upset the balance needed for results! Support your entire nervous system with this dietary supplement co-formulated by one of the most respected chiropractors in the field and a highly-accredited Immunologist! Complete Neuro contains potent nutrient support for the nervous system, with ingredients such as resveratrol, sulforaphane, quercetin, curcuminoids, garlic, gingko biloba extract, benfotiamine, and rhodiola rosea. Neural support is helpful in cases of nerve dysfunction or damage, after toxic assault on the nervous system, when addressing the aging of the nervous system and for cognitive/brain functions. Ask us about this super brain-supporting supplement today! A big "THANK YOU" goes out to you, our patients, for your wonderful patience with the new computer software. Checking in is different now, and you have all been gracious enough to expect the changes and take them in stride. You are greatly appreciated! *All promotions and discounts are only allowed once and only one discount at a time from regular price.